Wild: Carbonemys obibimus is one of the least aggressive creatures on the island. Were it not for the plethora of predators on the island, I’m certain it would spend its days basking in the sun, eating, or sleeping. Carbonemys leads a simple, solitary life. It seems to be one of the most peaceful animals I have yet encountered. Domesticated: Carbonemys ‘ swift swim rate, fairly high strength, and lack of real threat makes it an ideal aquatic mount for many coastal survivors who shy away from violence. It can carry its rider to the ocean’s resources at a fairly high speed, and are not particularly dangerous to tame. Known Information: With its slow walking speed, the only things that keep it safe are its surprisingly fast swim speed, and its incredibly thick shell. 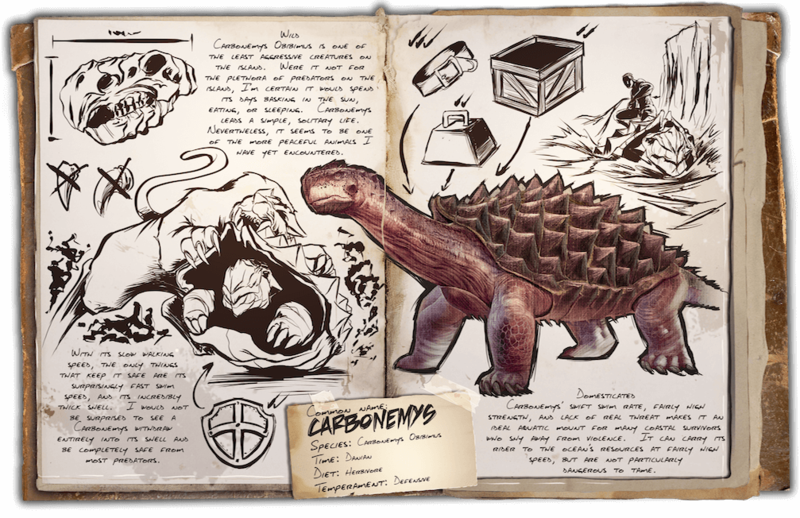 I would not be surprised to see a Carbonemys withdraw entirely into its shell and be completely safe from most predators.